What does a healthcare worker owe a patient? Basically, says Dr. Lisa Lee, executive director of the Presidential Commission for the Study of Bioethical Issues, to protect the patient, and to keep the patient safe. "Healthcare workers should protect the vulnerable," said Dr. Lee. "We should implement a comprehensive approach to ensure that the vulnerable are protected from influenza." She said this also speaks to the question of whether healthcare workers should be required to immunize. Lee spoke at Samford University's annual Healthcare Ethics and Law (HEAL) Institute conference Friday, April 11. The program, sponsored by Samford's McWhorter School of Pharmacy, examined the theme of "Immunizations Across the Lifespan: Ethical and Legal Implications." "Healthcare workers might say it is their right to decide on immunization," Lee added. "But there is a professional obligation to protect patients." She noted that vaccines are only about 75 percent effective in a good year, and 50 to 60 percent effective in a bad year. The key here is that "benefit accrues only when the whole population takes part" in immunization, she said. "If required, healthcare workers will immunize," she said. "There is growing evidence that immunization reduces morbidity (death) among patients. Protection depends on full participation." Lee and Dr. Bruce White, founder of the HEAL Institute, received Pellegrino Medals for their contributions to healthcare ethics during the conference luncheon. 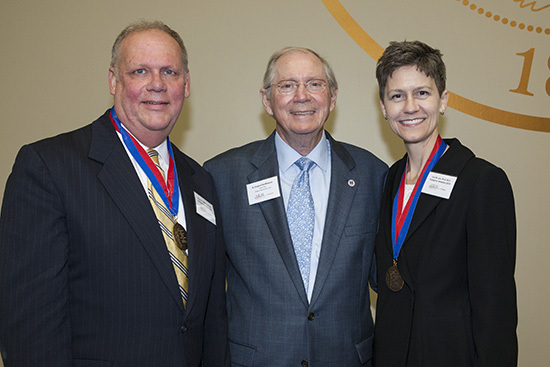 McWhorter School of Pharmacy graduate R. Clayton McWhorter presented the medals (center). The pharmacy school is named for his family. Pellegrino Medals are named for the late Dr. Edmund D. Pellegrino, the first recipient of a lifetime achievement award from the American Society for Bioethics and Humanities. The medal has been presented annually to world renowned clinical ethicists over the 13 years of the HEAL Institute's existence. Also at the conference, Dr. David Kimberlin, codirector of the Division of Pediatric Infectious Diseases at the University of Alabama at Birmingham, stressed the value of vaccines for children. "Vaccines are the most effective medical advance of the 20th century," said Dr. Kimberlin, "but parents too frequently resist having children vaccinated. Of the top 10 public health advances of 1900-1999, number one is vaccination." He noted that at the turn of the century in 1900, 16 out of 100 children died by the age of five, "but that is not so now." Vaccines save hundreds of thousands of lives every year, he said. Other speakers included Dr. William Schaffner, professor of preventive medicine at Vanderbilt University School of Medicine; Dr. Dennis Sansom, chair of the Samford philosophy department; and Dr. White.